Even if only 2 people enter this little giveaway, more power to the both of you :) !! I decided to get rid of these cute little roller skate booties.. worn only for this little photo shoot. so one lucky lady will get a free little pair in the mail!! could be a fun little gift or they will look adorable on your own babe. Winner will be announced next Wednesday! those really are totally precious! love them! i already follow you and no wi have liked you on fb! ABSOLUTELY love these!! Yay! I was waiting for you to do a giveaway for these. I hope I win! Stinking cute! I would love to give these away as a gift...I just WISH I had one of my own to give them to! I would LOVE LOVE LOVE to win the roller skate booties! I am a photographer who would love them in my studio, as well as a roller derby girl! The cutest booties I have ever seen! Who comes up with these ideas?! So precious and would love to win them. Already a follower of your site and on fb. 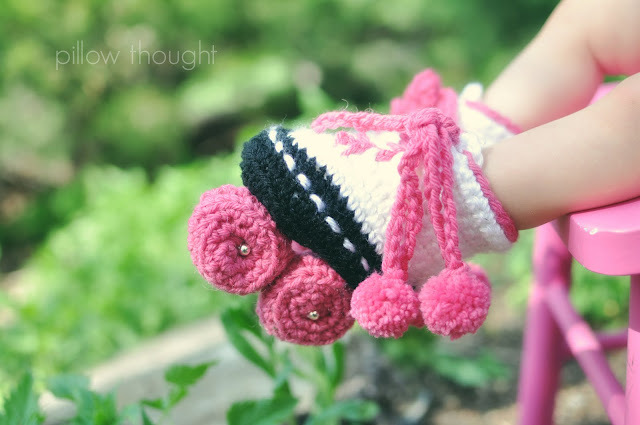 So stinking cute I want these cute booties and I am a total blog stoker love all your creative fun ideas! So cute!!! Will come perfect for my 5 months old daughter!!!! I'm follower now!! !